Nationwide Delivery Guaranteed for Christmas at our lowest, standard, shipping charges! All orders placed by December 19th at 1 PM will arrive nationwide before Christmas Eve weekend. Standard Rates Apply to Contiguous State Only. Standard overnight service is available until December 21st at 3 PM and will arrive on December 24th. Additional charges apply. After 3 PM on December 21st, packages shipped via standard rates (ground delivery) will ship the Wednesday after Christmas Day; December 26 and will arrive before the weekend of New Year's Eve nationwide. If necessary, we will upgrade these packages to arrive before the weekend at our expense to far away destinations. Dakin Farm ships quickly! It is never too late to send a quality gift from Dakin Farm and Vermont! 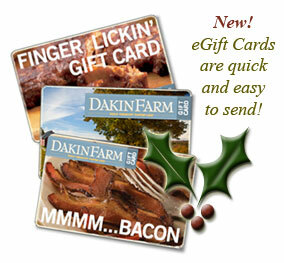 Share a taste of Vermont with a new Dakin Farm eGift Card. Remember: Orders for eGift Cards placed as late as 6 p.m. on Christmas Eve will arrive by Christmas! Choose from five delicious designs to give everyone on your list the perfect gift.